It's the holidays so go ahead and splurge, but be picky about it. Try these expert backed tips to avoid gaining weight this holiday season. Holiday weight gain might seem inevitable given that we often put a pause on our healthy habits until January. But having a strategy to avoid it could tip the scales in your favor — not just come the new year, but over the course of your life. Here’s why: On average, we pack on around 1 to 2 pounds during the holiday season and while that sounds like no big deal, studies suggest we don’t take it off. Ever. That means we enter each year a couple of pounds heavier — which can add up over the decades. And if you enter the holiday season already overweight, it’s likely you’ll gain even more, say researchers who've investigated the matter. But as they say, an ounce of prevention is better than a pound of cure so here are some expert-backed pointers for avoiding the typical holiday weight gain. Keep moving. When holiday activities ramp up and we’re gearing up for some out of office time, workouts are one of the first things to slip. But even if you don’t have time for an hour-long spin class or your typical yoga session, put in what you can. Exercise has a number of mental and physical benefits, and the science suggests it can counter some of the metabolic effects of overeating, even if it doesn’t wash out all those extra calories you’re consuming. Resist the all-or-nothing mentality when it comes to workouts and do what you can when you can — even if that’s just a quick routine in your living room. It may be especially helpful to enlist a friend. One study found that doing so led to increased activity, particularly if the workout partner provided encouragement and support. So grab a pal and go for a quick walk or make a weekly date to attend a group class. If you can’t meet up in person, have a virtual check in to encourage each other to keep moving. Be picky about splurges. Chances are, you don’t love all holiday food equally so consider which ones are worth it to you and which ones you can live without (or at least, live with just a little bit). In other words, it’s fine to have a food thrill or two so between the mashed potatoes, the stuffing, the pies, fruitcake, eggnog, gingerbread cookies and other holiday fare, but decide which ones deserve a spot on your plate and enjoy them mindfully. Don’t reserve an equal spot for the stuff that doesn’t totally wow you. If the stuffing is your thing, have a spoonful, but if you’re not all about apple pie, you might want to skip that or just have a bite or two. Don’t save your calories. 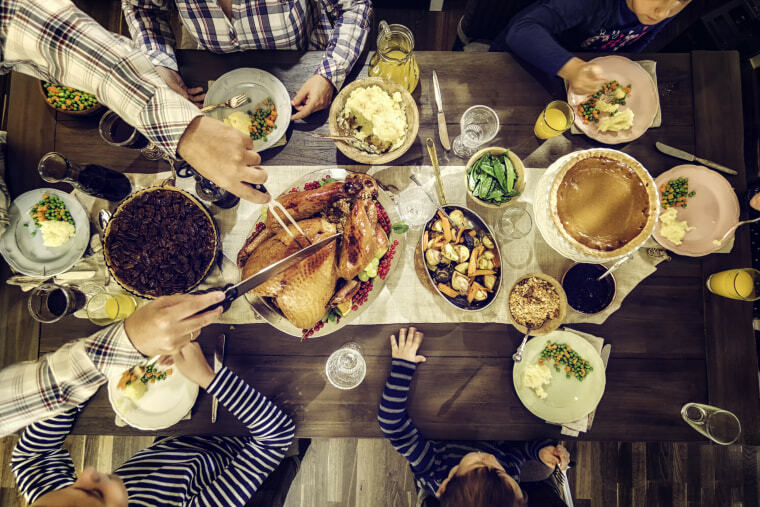 It’s common to try to eat lightly in an effort to save calories for the holiday meal, but this plan can backfire quickly because when you’re beyond hungry, it’s hard to stay in control of your food choices. (Real talk: When you enter a party starving, do you make a bee line for the crudité? I don’t!) Instead of eating ultra-lightly or even fasting, try having a late but satisfying breakfast or brunch. Since holiday meals tend to be on the early side, you may not need to eat on your normal schedule so a meaningful brunch might be enough to keep you content and energized until you hit the main affair. Your non-holiday meal should include the winning combo of protein and fiber — the nutrient duo that helps tame hunger. Some examples: A yogurt parfait or smoothie made with Greek yogurt, berries and a portion of nuts or nut butter; a salad made with greens, leftover roasted veggies, canned tuna, and a drizzle of dressing; a grain bowl with the grain and veggie portions reversed (to boost your veggie intake) made with chicken or turkey. This format keeps things light but filling so you can stay in control of your holiday choices. It’s also a good structure for meals on your non-party days. Drink wisely. Alcohol can weaken your inhibitions so while you might have intended to skip the baked brie, a couple of drinks might spur you to change your mind. Beyond that, alcohol can disrupt your sleep (which can impact your appetite and food choices), and leave you with a next day reminder (hello, hangover) that could also sway your food choices. (Have you ever craved leafy greens while hungover?) When possible, stick with the recommended caps of one drink a day for women, two for men, and try to avoid sugary mix-ins, which can worsen the impact of alcohol, among other things. Remember your hunger/fullness cues. Just as it’s important not to enter a holiday affair starving, it’s also important to stay tuned to when you’re feeling content. Feeling content means you’ve satisfied your physical hunger and you’ve shown your taste buds some love. It’s not just about one or the other; you need to check both boxes to feel a state of contentment. Let’s assume your holiday food is doing its job of keeping your taste buds happy. Now it’s your job to figure out when you’ve had enough to eat. It’s a good idea to check in with yourself about mid-way through your meal to make a mental note of how you’re feeling. Just thinking this through helps you connect to what you’ve eaten and assess what’s left on your plate. And remember, there’s no need to finish what’s on your plate just because it’s there. When you’ve reached a point of contentment, show your body some respect by not pushing it past the point of fullness. Bounce back. After each party, you have two choices: Continue with the holiday fare or revert to your healthy habits. Having one festive meal is no big deal, but having two, three, four and five can lead to weight gain. I always ask my clients this question: What do you do when your phone screen cracks —handle it gently from then on or throw it across the room and cause more damage? Inevitably, there will be some big meals and indulgent desserts during the holidays but there’s no reason why there can’t be healthy and lighter meals in between. Limit the leftovers. Okay, you don’t have to leave the turkey and Brussels sprouts alone, but you might want to skip the leftover stuffing, mashed potatoes, and pecan pie. This gets to the point of bouncing back. I repeat: One meal won’t make much of a difference, but consistently splurging can really add up! A holiday meal is just that — one meal. Enjoy it, but try to leave the leftovers alone. Weigh yourself. It’s hard to notice when you’ve gained a pound or two, but your scale can pick up these small gains, which is why weight monitoring can be such an effective way to prevent weight gain. In one new study among more than 1,000 adults, daily weigh-ins over the course of a year led to small, but significant weight loss, even though participants weren’t instructed to lose weight. Another study among college freshman found that routinely hopping on the scale wasn’t linked with any difference in mood, body dissatisfaction or unhealthy weight control behaviors (like excessive exercise or food restriction). Certainly, If the scale produces anxiety, makes you question your worth or causes any disturbances to your emotional well-being, it’s not the right tool for you. But if you can look at the numbers without judgment, the scale can provide useful feedback and help prevent weight gain. Keep calm. The holidays can be a stressful time of year. The extra events — even if fun — can put a strain on your schedule that can be overwhelming, and family dynamics might also be challenging. Research suggests that stress can lead to less healthy food choices, and it also impacts hormones that can prompt you to store belly fat. A mindfulness practice can help dial down the stress (and the hormones), and help reduce cravings, according to recent research. Carve out a few minutes to do some deep breathing or a guided meditation to cope with holiday or family stress. Get sufficient sleep. Insufficient and poor quality sleep really take a toll on your metabolism and health. In one study, sleep deprivation resulted in changes in brain activity up your desire for unhealthy, high calorie food—the type of fare that cause your clothes to feel tight. Researchers speculate that lack of sleep dampens your motivation to stay on track while also amplifying your cravings, making it doubly difficult to eat well. Know when to call it a night and aim for the recommended seven to nine hours of sleep each evening.